Let the benefits of this luxurious swim spa take you away. Get a vigorous home workout with the ultra powerfulSynergy™ swim jets. Enjoy an additional work out with the standard AquaFlex™ swimming system. With a full 10'-10” swim area, there is plenty of room for swimming and additional workouts. Warm massaging comfort is found in the Captain's Chair™ with hydrotherapy jets spanning from the neck to the ankles, or the contoured bucket with aline-up of high-powered jets providing tension relief to the over-worked back region. Make use of the 2 RX6™ stand up jet systems to help get your muscles ready for a great workout, or after for a nice tension releasing massage. 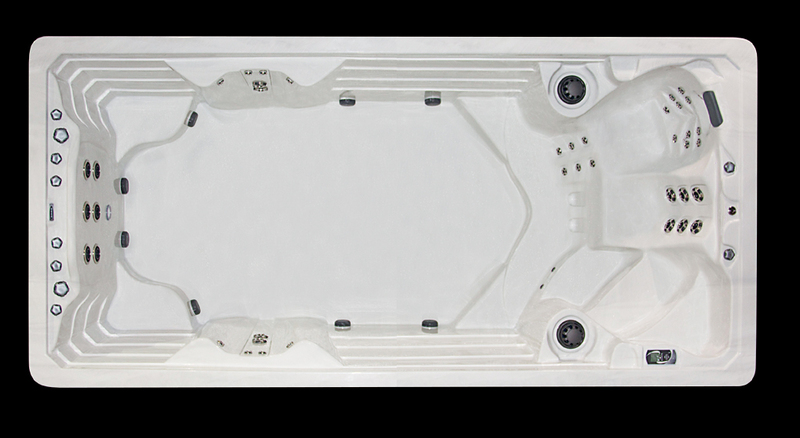 * Swim Spa Warranty: 35 Year Warranty Shell, 15 Shell Finish, 5 Parts & Plumbing, 3 Labor. * Sunstar COVER inc w/Spa order: ($433. value per section) 3 yr. warranty, Wildwood Rust or Ash Gray. This product was added to our catalog on Saturday 10 March, 2012.